Protesters outside of Parliament calling for Brexit to be stopped on Tuesday night. Nick de Bois, former Chief of Staff for Dominic Raab has said that even if Theresa May’s next Brexit deal is passed by MPs, it could be impossible to turn the deal into legislation by March 29. MPs are set to return to the House of Commons on February 14 to vote on any progress the Prime Minister has had on her EU Withdrawal Agreement. He told talkRADIO’s Mike Graham: “I don’t think we can go 24 hours ahead with any real confidence. Some people would say that she has kicked the can down the road further last night but talks will take place to see what can be explored. He added: “The point is that I don’t think you can look much further ahead than that vote. What I would say is that it is easy to forget that if the memorable vote passes on the deal, actually hard work only then just begins. 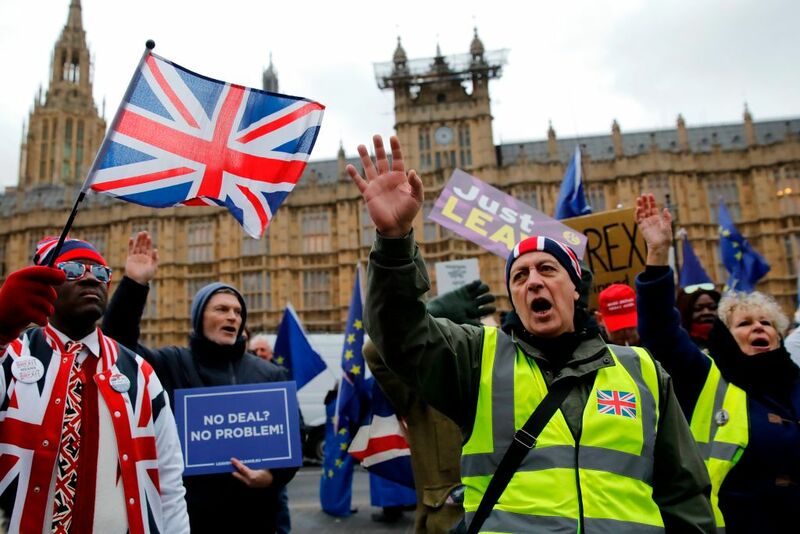 Pro-Brexit supporters outside the Houses of Parliament on Tuesday as MPs voted on Brexit amendments. Mr De Bois added that the Prime Minister should not have allowed the backstop to become such a problem. “The reality is that we should have had this political discussion with the EU about the backstop back in September when it was really clear that it was going to be the issue,” he said. MPs supported an amendment on Tuesday night to replace the backstop with “alternative arrangements”.